Anyone whose business involves selling something can tell you there is no shortage of information and research about connecting with millennials. But as millennials capture marketers’ attention, 75 million influential customers, between the ages of 51 and 69, are out there ready to spend. Influent50® researchi shows that marketers today are either speaking to Baby Boomers ineffectively – or ignoring them altogether – and the impact is so profound that Boomers themselves are taking notice. 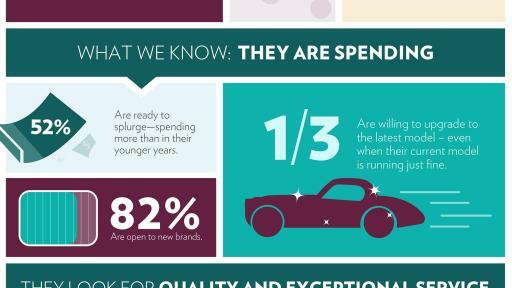 Today we know more about consumers than ever before and the numbers speak for themselves. In the U.S., people age 50 and over control 70 percent of the entire nation’s disposable income, spending $230 billion on consumer packaged goods annuallyii. More than half of Baby Boomers (52 percent) told us in a recent survey they are more willing to splurge on purchases now than in their younger years. Despite those facts, less than 10 percent of marketing dollars specifically target this demographic. One of the biggest reasons for this is marketers are beginning to close the book on this generation by relying on outdated stereotypes to inform decisions and craft messages that ultimately don’t hit the mark. It takes more than a Rolling Stones song on a 30 second TV commercial. Half of Baby Boomers (47 percent) told us in this same survey that companies are using inaccurate stereotypes in advertising about people their age. An overwhelming 83 percent of Baby Boomers surveyed say that brands are making some kind of mistake when trying to appeal to their age group. One-third (36 percent) of respondents agree that marketers “get it all wrong” when it comes to advertising to people between the ages 50-69. It’s clear, what businesses thought they knew about the 50-plus simply isn’t ringing true with Baby Boomers today, primarily because Boomers are reinventing life after 50. This means increased discretionary spending on products and services that help them build rewarding, meaningful, enjoyable experiences in what they view as their second adulthood. The 50-plus are very active, but not necessarily on the beach or golf course. Some are taking the opportunity to work, choosing a new job or career that they enjoy, whether for financial reasons or for personal growth and fulfillment. They are putting away their writing paper and stamps and using technology – social media, in particular – to maintain relationships with friends and stay in touch with family. Start engaging with the 50+. It is important to throw away old assumptions about the 50-plus and accept the reality that growing older isn’t all about beaches and bingo nights. Aging has become a point of rediscovery and renewal. We live in an era in which the value of consumers’ attention is at an all time high and difficult to harness. In those moments, can you afford to speak to them ineffectively – or perhaps not at all? In the U.S., people age 50 and over control 70 percent of the nation’s disposable income, but businesses are budgeting less than 10 percent of their marketing dollars on themiii. Boomers are spending more time online (not including time at work) each week than even millennialsiv. More than 50 percent of those ages 51 to 69 are online at least 15 hours a week, versus just 41 percent of respondents ages 18 to 33. The biggest impact a marketer can make on successfully reaching influential Boomers is to throw out stereotypes and generalities and build customized campaigns. i. This survey was commissioned by Influent50 using ORC International’s Generational Online CARAVAN Omnibus. The survey was conducted among a sample of 1,000 baby boomers between the ages of 50 and 69. This survey was live on May 13-18, 2015.
ii. “Boomers: Marketing’s Most Valuable Generation,” The Nielsen Company & BoomAgers LLC, 2012.
iii. 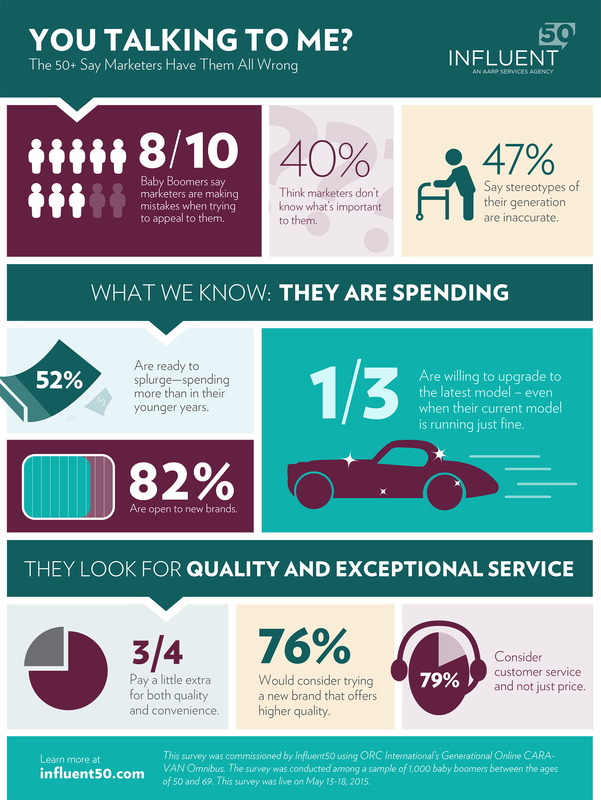 “Boomers: Marketing’s Most Valuable Generation,” The Nielsen Company & BoomAgers LLC, 2012.
iv. “Getting to Know Americans Age 50+,” AARP Research 2014.